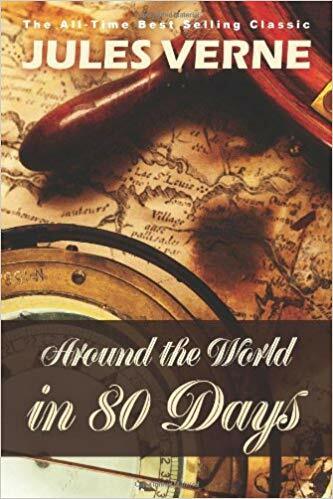 In Jules Verne’s novel, Around the World in 80 Days, the calm, orderly main character, Phileas Fogg, makes a wager that he can travel around the world in eighty days. He does this on October 2, 1873. Today we have fun holiday in honor of this fictional occasion, “Phileas Fogg Win a Wager Day”! If your family hasn’t read Around the World in 80 Days, October 2 would be a perfect time to start. Of course, anytime is a good time to begin such a thrilling adventure. We chose to “read” this classical story via audio a couple of years ago and the whole family loved it! The reader from “Loyal Books” was excellent. Please note that Around the World in 80 Days is not a children’s book. There are some rather mature scenes in Verne’s tale, however my youngest (11 at the time) was fine after some discussion. Actually, this book inspired a lot of discussion. Here’s a collection of resources to add some extra fun and some lessons to the reading. Oh, and the movie from 2004 staring Jackie Chan? Let’s just say it was barely based on the book. Just barely. This entry was posted in Calendar, homeschool, lesson plans, Literature, My Family, Our Homeschool, Resources, Special Days, teacher resourses and tagged Around the World in 80 Days, homeschool, lesson plans, literature study, Phileas Fogg Win a Wager Day, special days, teaching resources on October 2, 2018 by Betty Jo.